This year has seen a tremendous amount of rain and hurricane activity south of our borders. Our friends in the United States have been buffeted by storms that broke records for rainfall, wind, and mass destruction. But what is so amazing is that an estimated whopping 80 percent of homeowners in Hurricane Harvey's path alone didn’t have any form of flood insurance! Those homeowners who didn’t have flood insurance now rely on government aid and private grants to help them rebuild their homes and lives. This makes for a timely reminder for Canadian homeowners to review policy coverages and make sure there are adequate protections in place. Did You Know Flooding Is the No. 1 Naturally Occurring Threat in Canada? If you are like many of our clients, you may not be aware that flooding is the most common natural disaster to strike Canadian homeowners. In fact, flooding has now overtaken fire as the most prominent risk faced by homeowners throughout Canada. The reasons that flooding has become more severe of late vary. There are climate changes and warmer weather year-round. In many areas throughout Canada, outdated sewage systems and public works infrastructure can cause backup into basements and first-floor housing. New subdivisions are popping up on former swampland—and guess where the water still naturally runs! In 2013, large portions of Calgary and other Alberta cities like High River were literally under water. A few weeks later, a record-breaking series of storms created flash flooding throughout the city of Toronto and surrounding boroughs. The 126-mm (4.9-inch) rainfall exceeded even that produced by legendary 1954 Hurricane Hazel, and meteorologists do not make light of this trend. These 2013 events also accelerated the Canadian conversation about flooding and insurance. Until very recently, the only recourse for Canadians whose homes were damaged or destroyed by flooding was to submit a claim to Disaster Financial Assistance programs on federal, provincial, and territorial levels. But even with this recourse, in most cases proffered funds have not been sufficient to bring homeowners back to break even. They thought they didn’t need flood insurance coverage. They thought their homeowner’s insurance policy automatically covered flooding. They thought they could get sufficient reimbursement from government-sponsored disaster relief agencies. Unfortunately, not one of these three assumptions is accurate. Most homeowner’s insurance policies specifically exclude flooding. But here is the most important part of this post: there are all sorts of different types of water damage. Some are covered on your policy. Some are not. Most insurance policies give you the coverage you need to clean up the damage if a pipe bursts or a washing machine hose fails. Your policy would probably also cover water damage that resulted from a storm lifting shingles or, say, hail hammering your siding. If you purchase an optional rider, your policy would also cover your sewer or septic backing up. What you did not have prior to 2015, though, because homeowner’s policies in Canada did not cover this peril, was flood coverage. 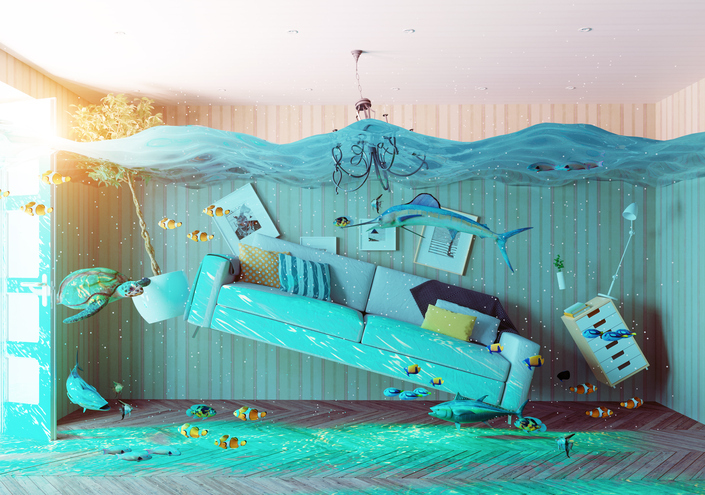 Beginning in around 2015, Canadian insurance companies began to offer a new type of water damage coverage—flood insurance. Many homeowners didn’t know they didn’t have it in the past, and some still don’t have it. Those who do have it may not know what it does and does not cover. To know what coverage you do and do not have, you will need to know the meaning of an insurance term: “overland water damage.” This is damage caused by a body of fresh water (such as a lake or stream) overflowing its banks and water literally flowing “over the land.” Overland water damage can also happen when there is no creek but the rain is so heavy that it accumulates and makes its own creek. This is the coverage that a number of insurance companies have brought out recently. It is important to know that Overland Water is just one of the ways flooding can happen—for example, a dam could burst or an underground stream could cave in the foundation of your house. Even though flood insurance is now available, not everything is covered. Every policy is different in exactly what it covers. Some types of flood damage are still not covered by any policy—for example, a tidal wave wiping out a shoreline community. Some insurance companies still do not offer flood insurance at all, though most now do. And for insurance companies that do offer flood insurance, there are differences between what one insurance company covers and what another one covers. So how are you as a homeowner supposed to navigate these “waters”? One step is to assess what you need. Your needs are different if your house is on top of a hill or if it is waterfront property. However, don’t assume that only people who can throw a stone from their deck and hit a lake or a stream need flood insurance. Almost everyone faces some level of risk. A second step is to talk with an insurance professional about what coverage you need, what coverage you do or don’t have now, and what your options are. Before 2015, any homeowner who experienced flood-related home damage was eligible to apply for government aid. But now that many insurers have started to offer flood insurance products as homeowner's insurance policy riders, eligibility standards for federal, provincial, and territorial disaster relief assistance are changing accordingly. Specifically, if you as a homeowner qualify for flood insurance and don’t know about it or choose not to apply, you may now be deemed ineligible for government aid in the wake of flooding. This leaves you without recourse in the event your home is damaged or destroyed by flood waters. The federal government of Canada has now begun to study future weather-related risks in earnest. Steadily rising costs for annual federal disaster relief funding to various affected areas throughout Canada speak loudly of the need to revise policies and budgets for weather events in years to come. For example, in 2004, the federal government paid out approximately $54 million in storm relief funds. In 2014, that number had risen to $410 million! Starting in 2017, the estimate jumped again to $673 million—and that is just for flood damages! Key areas for further investigation include rising sea levels, glacial melting, erosion of coastal areas, flooding from storm surges, and related storms and severe weather event activity. While certain parts of Canada are experiencing more rapid climate-related changes than others, there is no doubt at this stage that climate change has arrived and is here to stay. This requires action on everyone’s part, from individual homeowners to strategizing at the national level for how to afford flood insurance coverage for everyone who needs it. If you are concerned about the risks of flood damage to your home, Mackay Insurance is here to help. We can set up a time to review your current homeowner's insurance policy coverage and riders, re-evaluate coverage levels, and discuss optional flood insurance coverage based on the risk level to your area. Give us a call at 888-853-5552. You can also visit us online to chat with a broker live or send us an email.